In last week’s issue of Trader’s Corner, we provided the below chart and discussed the rapid growth in U.S. propane supply. We discussed why propane supply is outpacing growth in domestic and export demand, leading to relatively low values for propane during the heart of the heating season. In today’s Trader’s Corner, we are going up the supply chain and focusing on the engine driving the growth in propane supply. More than 70 percent of U.S. propane supply comes from natural gas processing. The remainder comes as a byproduct of the crude oil refining process. 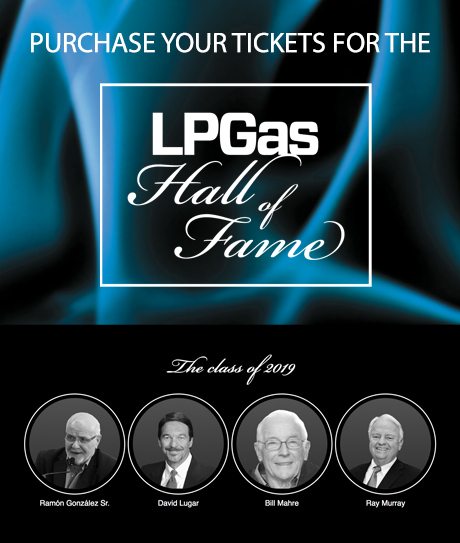 For years, practically all of propane supply’s growth has come from natural gas. The chart above plots monthly U.S. natural gas marketed production. Marketed natural gas production is that which is left over after the natural gas producers use what they need in the production process. The latest production data is only available through October 2018. 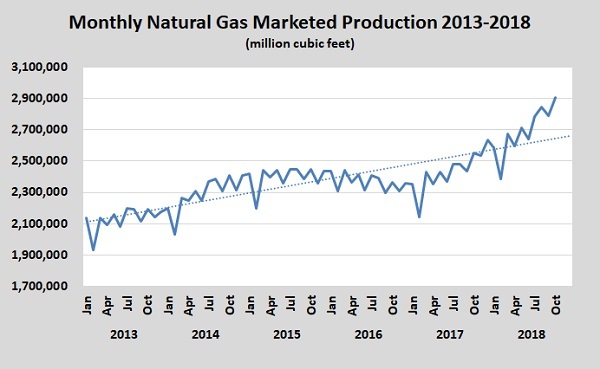 It shows that following a lull in the growth of natural gas production in 2015 and 2016 that growth in production resumed in 2017 and 2018. 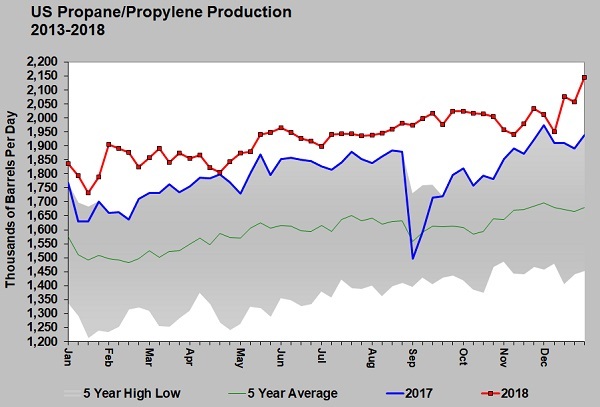 The production ramped up in the latter months of 2018, which corresponds to the late-year surge in propane supply. To see if this natural gas/propane supply train might be slowing, we must first look at natural gas drilling activity. The chart above shows there is little sign the engine will idle down. 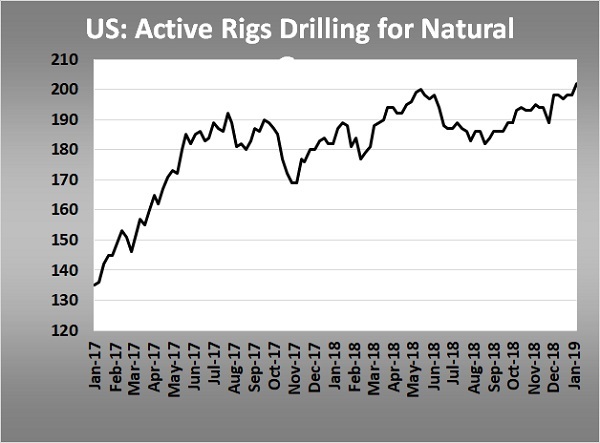 During the week ending Jan. 11, 2019, U.S. natural gas producers had 202 drilling rigs available. That is 15 more than the same week in 2018, and 66 more than the week of Jan. 13, 2017. This winter, U.S. propane prices have been under downward pressure because growth in propane supply is outpacing growth in propane exports. 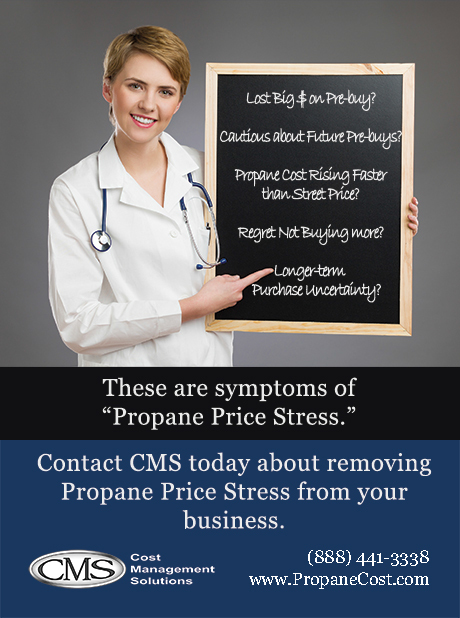 The result is a year-over-year increase in propane inventory. 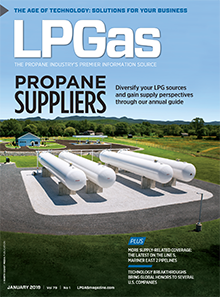 At the end of 2018, U.S. propane inventory was at 70.653 million barrels, compared to 67.676 million barrels at the end of 2017 – a 2.677 million-barrel increase. The overhang increased to 9.492 million barrels on Jan. 11, 2019, when compared to inventory levels for the second week of 2018. The propane supply engine remains revved up. If it does not slow down, prices will be under downward pressure to encourage more domestic consumption and exports.